Some 'weak' Chief Justices made it a point to educate themselves. Not Khehar. 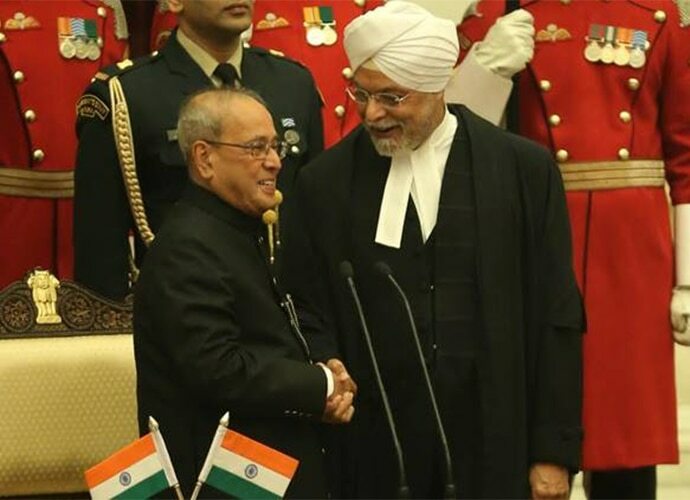 Chief Justice JS Khehar’s brusque term of eight months has come to an end. Among the least distinguished Chief Justices of India, his term must rank among the lowest. At the sesquicentennial of the Allahabad High Court, Khehar is reported to have said that when he became a judge, his legal knowledge was only service law (sirf ek field aati thi, usme main sab kuch bata sakta tha, baki kuch nahi aata tha). On his own candour, he was not fit to be appointed a high court judge and should have been appointed chairman of a service tribunal. As CJI, Khehar’s basic depth in law was wanting. Of course, what Khehar said of himself is true of many high court appointments. The service judges knew little constitutional law and the bar judges were wanting in many basic areas of law. Compare Khehar with other CJIs. We cannot fault pre-Emergency judges. Post Emergency, we have Chandrachud, Bhagwati, Verma, Venkatachaliah, Ahmadi, Kripal, and of course, Sabarwal. On law, Khehar ranks with the 18-day Chief Justice KN Singh; Balakrishnan (who at least tried, but to my knowledge had judgments written for him) and Khare (who could not dictate his orders in court). Thakur was a good judge but a bad CJI. Chief Justices are appointed on the seniority principle with long term political intrigue or mindlessness. A proper system of appointing CJIs and, at least Supreme Court judges does not exist. Khehar wrote notable judgments in the NJAC and Arunachal cases, which are of poor quality. His orthodox view of what constitutes a Sikh, is shallow. Some “weak” Chief Justices made it a point to educate themselves. Not so Khehar who seemed too arrogant to want to learn. When he tried to defend Chandrachud’s highway-liquor vend judgment, he was at his obstinate best, knowing very well that he had to backtrack. On the contrary, Justice Krishna Iyer reminded the judiciary that the hall mark of a judge is to accept when he is wrong. Khehar redefined the role of a Chief Justice. His predecessors with comparable tenures tidied up specific areas. Lodha brought in three advocates as judges, of which one is a disaster. But this brought balance to Supreme Court appointments. Dattu showed admirable skill on the service conditions of Supreme Court employees, and enlarging the new premises for the registry expeditiously. Khehar's self-description was imperial. He collapsed eight courts into four to give more space for courts in the East wing. The architectural result is a total disaster. SCBA President Suri says he was barely consulted. It was all done during the vacation. Khehar genuinely believed that as CJI he had the power to do what he wanted. He then felt that the Supreme Court’s vacation should be curtailed, overlooking the intensity of the court’s work. One reason for this, it seems to me, is that unlike others he was not very laborious in pre-reading his briefs but pontificating as if he had. In this vacation, he heard the triple talaq case (which should never have been heard then) but had to abandon the WhatsApp and Migrants case. Why these cases? Was this his agenda or the governments? Or did they just coincide. Post vacation, he embarked on an emergency hearing on the constitutional status of privacy – genuinely believing that with nudging and bullying, the matter could be concluded in one day! The bar rose to the challenge to educate the nine-judge bench, amongst whom only two (possibly three) were familiar with the intricacies of the subject. Why did he do this? On a whim is the best explanation. This was like Lahoti (displaying Hindu orthodoxy) setting up the cow-slaughter bench a few days before retirement. This is quite different from Bharucha giving priority to Constitution (five-judge) benches. So what is missing in all this? The Chief Justiceship is of India is not a sultanate even though at least one CJI thought it was; and told me proudly. “I don’t have to consult my colleagues” The CJI as sultanate idea will ruin the Supreme Court. Imagine how skilfully SR Das and Venkatachaliah handled the colleagues with respect and consultation. From Ahmadi to Khehar there have been many sultanates. Khehar’s is the most peremptory seeking publicity to display his power. This brings us to judicial appointments. In the NJAC cases, Khehar had blundered over the Memorandum of Procedure (MOP) to be followed. This gave the government leverage and tearfully paralysed Thakur. Anyhow, Khehar worked out the MOP accepting the government’s veto on “security” grounds. Since security can mean anything, the government’s veto is wide. Everything is in the black box. Prashant Bhushan rightly asked for the minutes on the appointment of the CBI director to which Khehar was a part. “No” was the answer. Now 6 SC and 91 high court vacancies have to befilled. The problem is Chief Justices negotiate with government. They would be better off doing so collegiately after consulting all the brethren for collegial strength. “Pow-wow” in the dark is not the answer. A controversy arose about former Arunachal CM’s suicide implicating Khehar’s son in a bribe scandal. Dushyant Dave was right to criticise how Khehar dealt with this instead of an administrative inquiry. Likewise, Suri, President SCBA was right in criticising appointment of judges’ sons as judges, lawyers on State panels, etc. Khehar took this personally, getting the facts wrong. Khehar is a bad example to follow.